The Aerospatiale (Nord Aviation) 262A is a twin-engine short-haul commuter airliner jet for up to 29 passengers. Originally known as the MH262 Super Broussard, the Nord 262 was designed by the former la Société des Avions Max Holste. Development of a 17-seat light commuter airliner, known as the M.H.250 Super Broussard started in 1957. The prototype of the MH250, powered by two Pratt & Whitney Wasp-1830 piston engines, flew first on 20 May 1959. It was soon realised that turboprops should be employed and further development resulted in the MH260 with enlarged fuselage and powered by Turboméca Bastan turboprops. In October 1959, Avions Max Holste entered into a co-production arrangement with Nord Aviation so that the new aircraft could be manufactured. On 16 February 1960, Cessna Aircraft acquired a 49% shareholding in la Société des Avions Max Holste, which was entitled the Société Nouvelle des Avions Max Holste. This name was afterwards changed into Reims Aviation S.A. The prototype of the M.H.260, the F-WJDV, flew on 29 July 1960. Ten MH260 with its rectangular section fuselage were built by Nord Aviation as the Nord 260. In 1961 started a significant redesign of the Nord 260. This resulted in the Nord 262 that had a redesigned fuselage with a circular cross section, pressurisation and more powerful powerplants. On 24 December 1962, this pressurised Nord 262 made its first flight. On 1 January 1970, the main three French nationalised aircraft companies - Sud-Aviation, Nord Aviation and the missile manufacturing company, SEREB - were merged into Aérospatiale. As a result of this merger the Nord 262 became a product of Aérospatiale. When production ended in 1976, a total of 110 Aerospatiale (Nord) 262 were built. 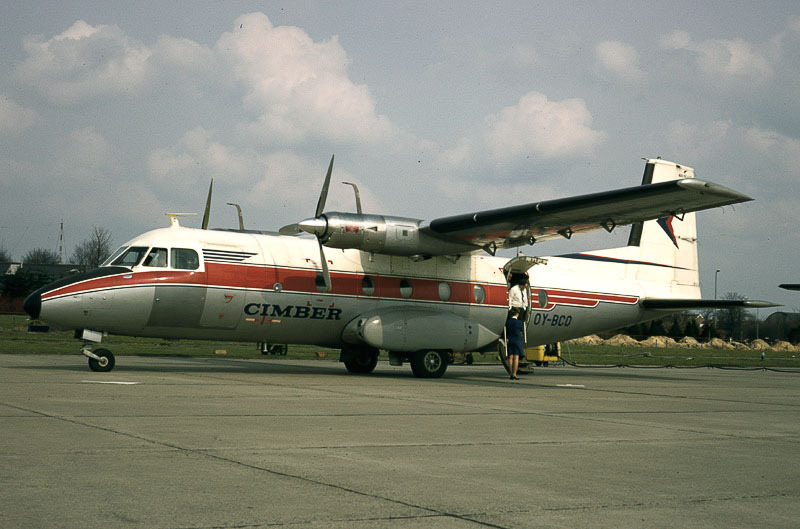 On 11 April 1970, Nord 262A OY-BCO and OY-BKR of Cimber Air Denmark A/S came in at Groningen Airport Eelde in the Netherlands. The OY-BCO made its first flight on 30 March 1967, as F-WNDD and was delivered as OY-BCO to Cimber Air on 8 July 1967. In 1977, the Nord 262A was sold in the USA and registered N274A with Altair. The N274A was transferred to National Commuter Airlines in April 1982; leased to Pompano Airways in January 1984. On 3 March 1999, the registration N274A was cancelled as the Nord was sold in Honduras. In Honduras this Nord 262 is operated by Aerolineas SOSA as the HR-ARP.